John Davis Mike Hughes doesn't pull rabbits from hats. He doesn't perform card tricks. And you won't see him saw a woman in half. He's a mentalist, not a magician. "I'm not a big fan of party magicians," says Hughes, a Web specialist at the Johns Hopkins Center for Alternatives to Animal Testing who has been studying mentalism since he was a kid. "People see a guy coming up with a deck of cards and they just want to hide." 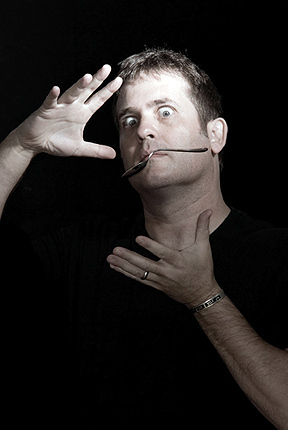 Hughes — whose act includes moving silverware with his mind, bending spoons without touching them, and reading people's thoughts — says that mentalism transcends the boundaries of traditional magic and is better appreciated by adults than by children. "Mentalism is a branch of magical arts that uses psychology, perceptual manipulation, persuasion, hypnosis, and elements of traditional magic to produce what appear to be psychic phenomena," he says. At home parties, stage shows, and trade shows, Hughes prefers to let audiences decide if he has psychic abilities. When he does tarot readings, for instance, he emphasizes that he's reading symbols, not predicting the future. "I'm just there to entertain people and give them a sense of mystery," he says. "I always tell people I do things anyone can do with enough time and study." Hughes is also a writer. His novel, Cabal, is a supernatural thriller that's currently with an agent. He loves writing but doesn't ever see leaving the study or practice of mentalism. "The world is kind of a mysterious place," Hughes says. "We don't understand half of how our minds work and how reality works. Being able to perform and evoke a sense of mystery in people, that makes me happy."